These ketogenic approved fat bombs are to die for! Only 3 simple ingredients are required to make this delicious low carb snack! 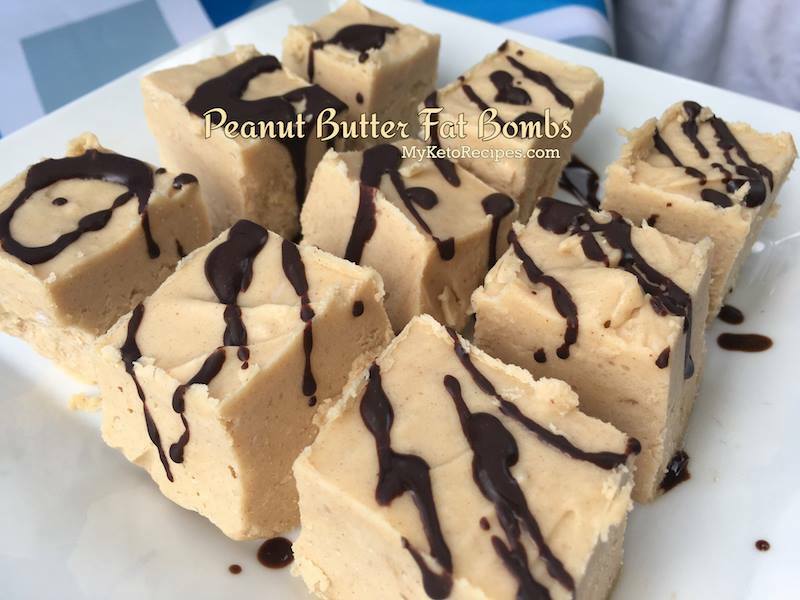 I LOVE peanut butter and it’s even better when it’s made into a keto approved FAT BOMB! Since starting a keto lifestyle I have become obsessed with fat bombs. They are the best keto snack and taste amazing! You can make any flavor you like and they are so simple to make. These ones are easy because they only call for three ingredients. You can add sweetener as well which is optional. I added two tablespoons of Swerve to mine. I prefer to use Swerve over other sweeteners because it has the best taste in my opinion. It’s also easy to bake with. I actually freeze these and then cut them into serving sizes and throw them back into the freezer. Fat bombs are made with coconut oil which melts really easily. I find if you keep them frozen until ready to eat, they stay formed instead of melting. If I am going somewhere and I’m bringing a snack I will put one or two in a small baggie to bring with me. 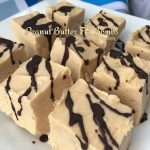 Another one of my favorite keto recipes is No Sugar Keto Fudge which tastes AMAZING! Since I switched over to a ketogenic lifestyle I am so happy! I feel fantastic and I have an abundance of energy! I also drink Keto OS which helps me have amazing mental focus and is really life changing for my mood and energy! I feel the best I have in my entire life! I am almost never hungry and small snacks like these ones keep me going all day long. Keto Shopping: What Foods should you buy when Following a Keto Diet? Add peanut butter and coconut oil to blender and mix. Add milk, then Swerve (optional). Please in molds or mini muffin tins and refrigerate or freeze for one hour. Whisk ingredients together and drizzle over chilled fat bombs. Return to fridge or freezer until ready to eat. Are these macros for 1/12 of the recipe? Or the whole recipe? Could I use Heavy Whipping Cream instead? What kind of peanut butter do you use? Is the powdered kind ok? I don’t use the powdered peanut butter. I use a low carb all natural one. I’m sure there is a way to use powdered but I don’t know what the measurements would be. Doesn’t the powdered peanut butter have all the fat removed? Wouldn’t that be counter-productive in a fat bomb? I have no idea. I have never eaten powdered peanut butter. I use an all natural, low carb peanut butter. Best to read the labels in the store and find the lowest carb option you have access to. How many is a serving? Made them and loved them, my question is, do I mesure the coconut oil as a solid or melted?? Doesn’t the oil measure a cup whether it is solid or melted? I just made these & I think they’ll be delish! They’re freezing now. I only used 1/2 cup of coconut oil. I’m hoping the oil in the peanut butter will make up some of the difference. What kind of coconut oil? Pure, Organic? Just coconut oil. Use whatever kind you want. Can we substitute Splenda for Stevia in your recipes? Awesome recipes. I’m especially looking forward to trying out the cheesecake and 90 second bread recipes. As for the Splenda vs. Stevia, I’ve tried, but can’t get over the soapy, bitter aftertaste of Stevia. Also, from my research, Splenda’s been given a bad rap. Don’t take my word for it, though. Try liquid stevia. I prefer the SweetLeaf, Sweet Drops brand. Splenda is chlorinated and can create health issues. Any sweetner that is not natural is taboo. I use Xylitol for most everything. the main ingredient is corn. so it is starch. Use Splenda Naturals to avoid the Stevia after taste. It is really good and 100% Keto approved unlike regular Splenda. I’m allergic to coconut oil. What can I use? Same measurements if I use butter ? Has anyone made them with butter or cream cheese? how is the taste? I’m just starting a Keto lifestyle, and wondering if I may use Amond Butter for these? Can you use heavy cream instead of almond milk? This is a very good and easy basic recipe to use to make different fat bombs. I did blueberries with cream cheese. Perfect! What brand of peanut butter do you use? I am having a hard time finding anything low carb or unsweetened. I only have liquid coconut oil right now. Would that work for this recipe or am I better off using butter? I’m allergic to coconut. What other day could you use and still have them taste good? What is the best sweetener in your opinion? One that tastes pretty good, without a terrible after taste? Thank you! Is the carb count different for almond butter? I didn’t have pb so I just used almond butter. They are so so so delicious!!! Thank You!!! I need a sweet treat in the morning of my new keto journey. Somehow I got 24 mini muffin sized pieces. Did I do something wrong? And so I should count two pieces as one serving? I just made these. I would count 2 of the mini ones as one serving. I want t try this recipe . I am so grateful for it, but I curious …Can I use liquid stevia? And would it be a different amount? They best sugar substitute is.. Monk Fruit.. Its all natural.. I can’t even tell it’s not real sugar… And ZERO after taste! I put the mixture in an ice cube tray, I got 13 cubes out of half the recipe. They are amazing!! I read it as “2 Tablespoon” of Swerve so I used 1 Tablespoon of Erythritol. They are perfect! !